The Fire Engine that is seen at all Santa Run functions is privately owned by the Muhitch family. Old engine 1 originally served Atlantic City NJ, and then was sold to Petie Hoppings of Eastport .The engine sat idle for several years before being transferred to the care of the Muhitch family. As with all things old keeping old engine 1 running requires some time and patient along with a lot of help. Old engine one is now dead lined. Old engine one suffered severe engine damage. It is unknown at this time if it is economical to fix at this time. We are looking for engine parts from a 67-72 ford f600-750. If parts are unavailable a replacement fire engine will be needed. Thanks to everyone who helped find parts donate parts and equipment. Take the time to wash wax and help get and keep old Engine 1 on the road. A special thanks to the Hoppings family who help make this happen. 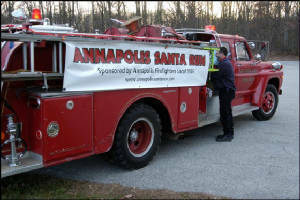 The Annapolis Santa Run is a all volunteer event that is sponsored by Annapolis Firefighters Local 1926. Each year on the second Sunday in December Santa and his elves set out in search of new toys for needy children in Annapolis and Anne Arundel county. 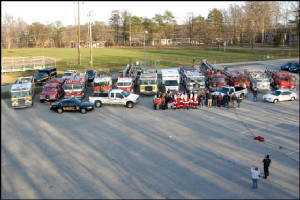 With the help of the community, local businesses, Annapolis Fire Department, Annapolis Police Department, Anne Arundel county Sheriffs Office, and many volunteers we have been able to brighten Christmas morning for almost 5000 children over the past ten years.